ST. PETERSBURG, Fla. — They still believe because they have to believe. The Red Sox might know, deep down, that seven games in the loss column with just 31 games to play is too much to overcome — too many bad losses, too many almosts and not quites — but they still act as if there is a chance for them to be playing into October. There is that chance, of course, but it’s just getting slimmer with each loss. And by losing two of three in the weekend series to the Rays at Tropicana Field — last night by a 5-3 score after leading, 3-1, in the sixth inning — their hopes have dimmed significantly. The Sox had given themselves a chance to get back in the race by winning Friday. Then they let it go, first by dropping Saturday night’s game in dramatic fashion, then by losing last night’s game in a more mundane, though no less upsetting, fashion, pushing themselves 6 1/2 games behind the Yankees and Rays in the AL East and wild-card races. Most dispiriting was the fact the Sox had wins within reach in each of the two losses. “We’re still in it,’’ Beltre said. “Nobody said that we’re out. It’s no doubt that the longer we wait to get a streak, a positive streak, the more difficult it’s going to be. We’re trying to make it better sooner than later. Because if we wait for later, it’s going to be tough, and then we’re going to play in panic mode. We don’t want to do that. Still, for Boston to steal even a chance at the postseason would nearly take a miracle at this point. And this team, crushed by injuries and misfortune, doesn’t appear to have a miracle left in it. “It’s not probably going to cut it to just win series, so we have to get like seven, six, eight straight games to win,’’ Beltre said. Yes, it is crunch time now. This was the time when John Lackey was supposed to shine. 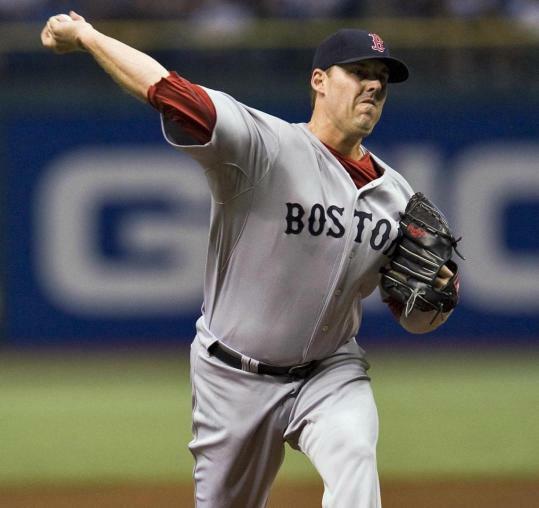 Lackey was the pitcher brought to Boston to pitch in such games. He had the big-game reputation, and yet little of that has been on display since he signed with the Sox. Instead, he came up small last night, allowing five runs on nine hits over 6 1/3 innings, the winning hit coming yet again from Dan Johnson. The bigger hits, though, were home runs on bad fastballs that the Rays destroyed. The first homer came from Carlos Pena, served with a down-the-middle 91-mile-per-hour fastball that he blasted out to right center in the fourth for a 1-0 Tampa lead. The second came from Carl Crawford, who lost a fastball into the right-field seats to wipe out a two-run Sox lead in the sixth. Crawford’s homer was followed by an Evan Longoria double, an intentional walk to Pena, an unintentional walk to Matt Joyce, and Johnson’s single up the middle that put the Rays ahead for good, 4-3. The Sox scored their runs in the fifth and sixth off James Shields (13-11). They got two in the fifth, the first scoring on Yamaico Navarro’s single that got Mike Lowell (double) home. Marco Scutaro followed with a single to left field to score another run. Their third run came in the sixth, as Beltre doubled and was driven in by a single by Daniel Nava. Afterward, it seemed like the Sox were mourning Saturday night’s loss more than last night’s. “We should have done better [Saturday],’’ said David Ortiz, 0 for 4 with two strikeouts last night. “Today was just one of those games that they got those opportunities, and they took advantage of it. And so the Sox left St. Petersburg for Baltimore and a needed day off, missed opportunities in their wake. Still, there are games to be played, so the Sox continue to believe in the possibilities of the 2010 season. “I’m not sure whether we’re five or six behind, we’ve got a lot more games than that left,’’ Lackey said.